What a lovely way to spend a Saturday - and it just keeps getting better and better! Here I am about to stitch the binding onto my poor quilt that has been waiting so long for some attention! Some time ago, I was so very fortunate enough to do a bindings class with Narelle Grieve! 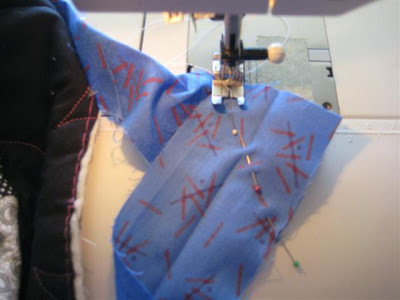 You will see I have prepared the binding and started sewing leaving maybe a 8/10" tail. 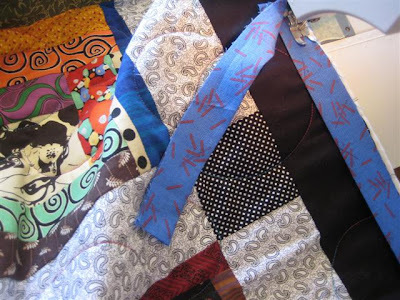 Right around the quilt, I stitched, mitreing the corners. I stopped maybe 8/10" from the end, then I left a lap over - the amount is determined by the width of the binding. Positioned and stitched across the 45 degree line! Trimmed to 1/4" and the pressed flat! 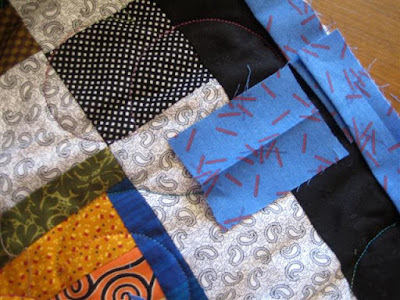 Give a gentle pull, lay onto the quilt and finish stitching over the remaining few inches. 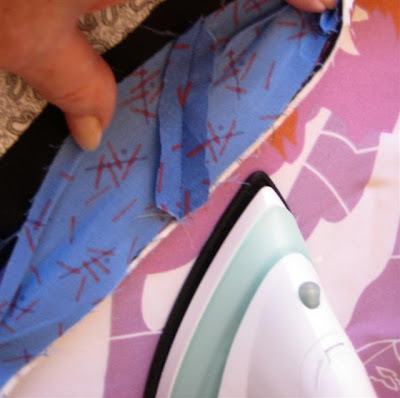 I guess a lot of you know this method and this is a very brief show and tell, so hope it helps a few along the way - it is the neatest way I know to finish a binding! 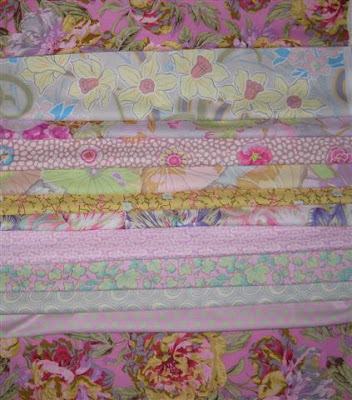 While 'scrounging/caressing' fabrics in my stash this morning, I came across this little assortment above - hmmm, I'm about to redecorate a room for the Littlies - could make a very nice quilt!!! My family is preparing Nachos for dinner (made by Angela) - yum, my favourite! - and then we are having a belated Birthday Cake (made by Ben) - this is one of the best Saturdays I have had for a long time! Hope yours is a good one, too! Whew - School's Back Soon! The Little Treasures are here with me now after a sleepover - seems like Nanny's place is the most popular - very little Lurline action is going on these days! 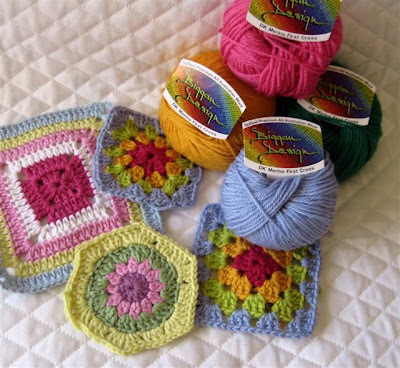 As I have mentioned, I'm trying to get off the ground with Granny Squares - now I'm not a wool girl, but this is glorious! It is created by Biggan, a Swedish fashion designer who emigrated to Australia - 64 glorious colours and I am particularly taken with the one above! A tiny bit of progress on my Icecream Quilt - I'll get there! Quite a bit brighter than the original! 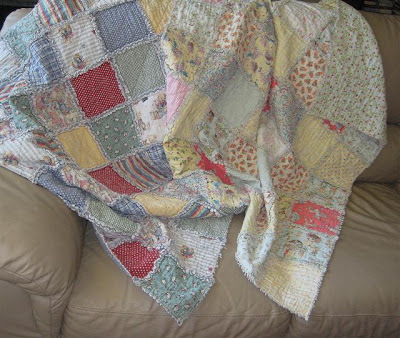 These blankies are nearly 6 years old - dearly loved and as you can see sadly worn - new ones are on the agenda and I have Byron's fabric ready to go - not quite settled on Heidi's yet! 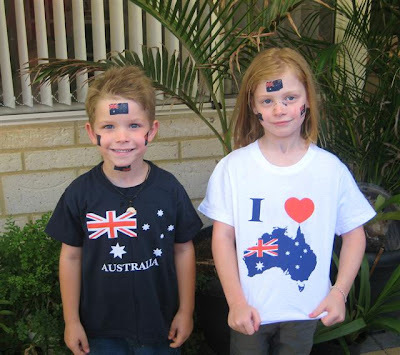 Proud little Australians - they have made the most of it this week! 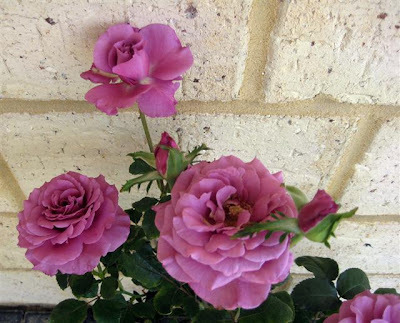 Happy day everyone! 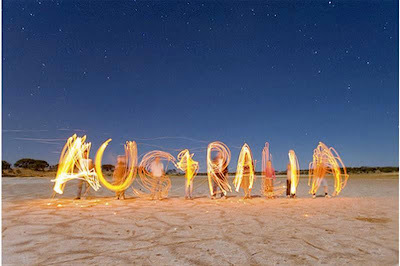 Today we all share our pride in our great country - as George Negus said on the 7pm Project last night 'Maybe not the greatest country on earth, but it is a great country'! There are lots of debates and controversies at the moment - I think it is wonderful we are able to have opinions on our country and look to the future! 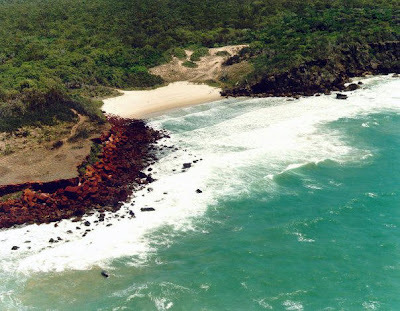 Below is one of the greatest places on earth, Turtle Beach in Arnhem Land - unspoiled , respected and very beautiful - happy memories! One step forward - two steps back! 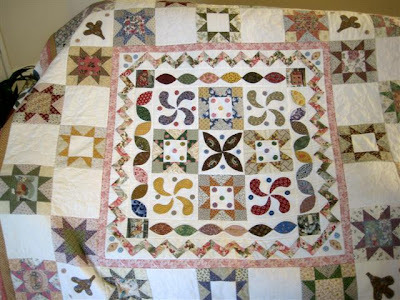 That's me at the moment - dear friend, Christine of Once Upon A Quilt ... is making great progress with her Icecream Quilt! Me - not going according to plan - I had a little play yesterday - didn't like it - so, it's back to the drawing board. Too soft and gentle? - lacking oomph? - maybe! 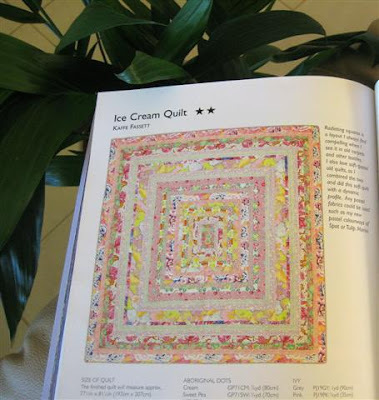 My Icecream Quilt will be lap size, so I'm also faced with juggling measurements to fit - may even be a tablecloth for my dining room! 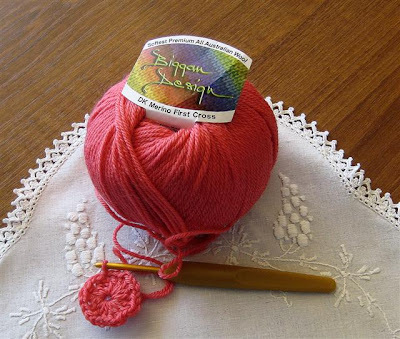 I'm also juggling wool for my Granny Squares - hmmm, really it is quite fun doing the trialling! Maybe I should stitch the binding on my Wonky Log Cabins - would be another nice finish for January! Off to a lovely local bistro for lunch today, celebrating DD Angela's birthday tomorrow! It's finished - I stitched the binding while I watched tennis last night. Another exciting night coming up tonight - our own Lleyton Hewitt v Marcos Baghdatis - of course I am a loyal Australian, but that doesn't stop me thinking Marcos has a certain charisma! 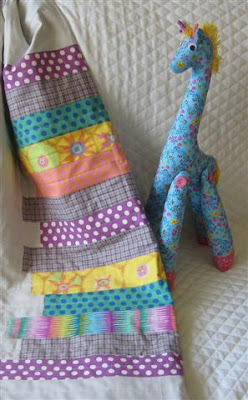 This little quilt is a gift for a wee baby boy - 7 months and pulling himself up on furniture already. 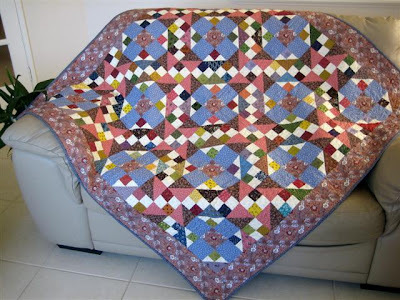 I used Quilt Lite for the batting, so it will be lovely and soft and cosy for him! Have a lovely weekend everyone - ours promises to be hot! Hot Days - Busy Days! Our heatwave continues - I am ever so happy to be in my lovely, cool house! It makes me feel a little spoiled and greedy knowing there is such hardship in the world, so I do count my blessings! 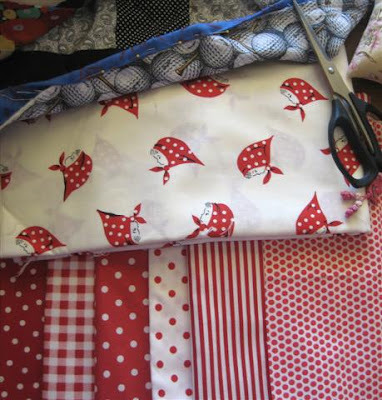 I have been making a baby quilt for a little one who is 7 months old - just the binding to do! He is just starting to pull himself up on things, so I must finish it and give it to him! 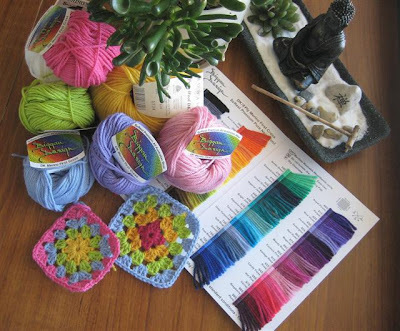 Trialling crochet - I have been playing with tutorials from Attic24 and do you mind if I knit - started with soft, gentle colours, but have the urge to do 'colour'! I really love the 'thicker treble' stitch created by do you mind if i knit, it is so very neat - that's the larger square on the left! I was unable to show you these last Sunday - too difficult to upload with computer problems. I am so proud of my Danielle's artistic talent - this painting of our infamous Ned Kelly she did in 1992 and has just given it to her brother-in-law, Ben, for his birthday. We all love it! By the way, talk about computer problems - all caused by my firewall being taken down and not reinstated - easily solved! 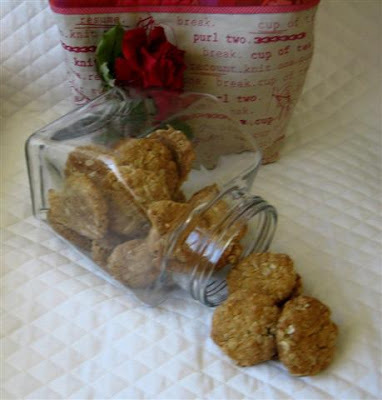 I also took this pic to show you - our Australian Anzac Biscuits - ever so popular, they were demolished before we started our barbie last Sunday! Must move out of my igloo and get things done in the real world today - happy day everyone! Oh, my goodness - all my good intentions haven't happened! It has been more than frustrating trying to work out why I can access the Internet via Google Chrome, but not through Internet Explorer. 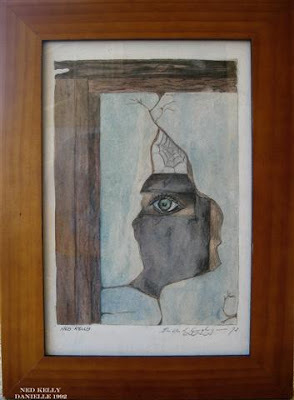 One thing I have learned is how to upload a pic through Picasa and now I am able to talk to you! I have managed to finish off one secret RAK and make another - thanks to all who told me you thought my fabric choices would work - I think they have! 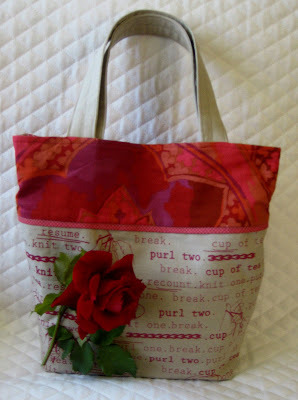 The knitting bag is made from a pattern of mine that was in DUQ last year - Happy Bag! With all the playing about with the computer, I have managed to answer most of my emails, still a few to go, I always seem to be lagging behind. I have all my family coming around in an hour or so and Ben, son-in-law will cook a barbie and the rest of us will stay inside in the cool, air conditioned house - oh, we are so lucky to have it on a day like this - a scorcher! Hope you are enjoying a happy weekend! 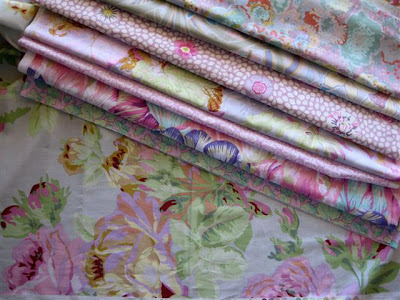 I have selected my fabrics, now to decide on size, whether it is to be a tablecloth or a bed quilt! 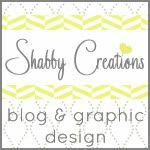 I hope I haven't confused you with my Sneak-Peek - it is a nice little table topper! Here they are! 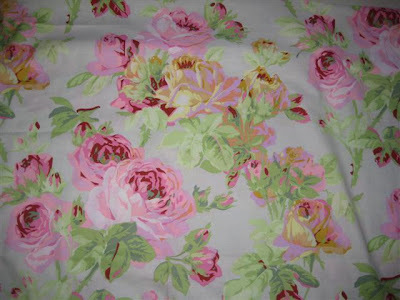 Once again I'm showing you the feature fabric I have selected - one of Philip Jacobs, complimented by several others of his and of course, also Kaffes. The yellow is a ring-in, I think it kind of talks along with the others and has something to say! Perhaps a metre left on the bolt - another Philip Jacobs, below and isn't it just so gorgeous - fate unknown! 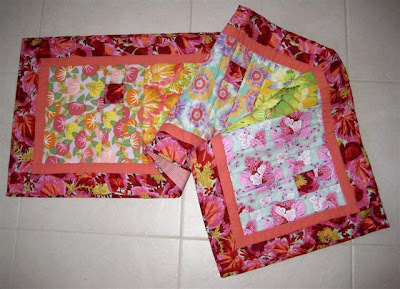 Would you combine these two fabrics? 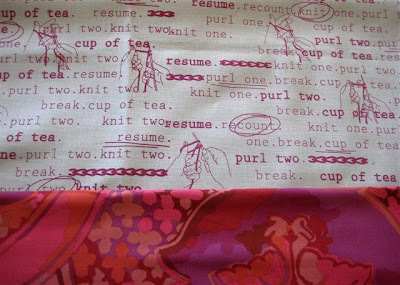 I love the top one and want to make a small bag as a RAK - I think the Kaffe just lifts it and makes it quite unique! 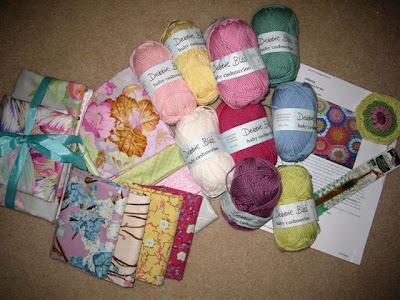 Oh, I hope it is a lovely stitchy weekend for me, lots of little finishes and hopefully a start on my new project. Enjoy your weekend! This has been a little difficult to photograph artistically - never mind, you will be able to have a little look-see and will get the idea! 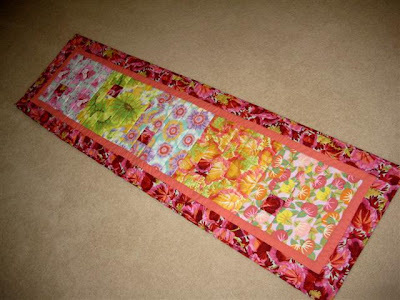 I enjoyed making this runner, the hera marker helped with nice lines to quilt! Just a few more stitches to finish o the binding, then a label and that is another finish for 2010! Girlfriends! 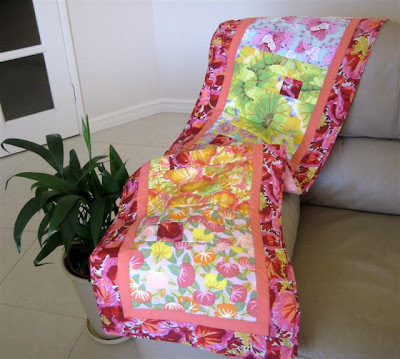 are coming here for sewing today, will be a lot of fun to get together after the Christmas break and we have two birthdays - beautiful warm weather, as good as you can get! Shopping at Calico & Ivy! I have been waiting for Calico & Ivy to open after the girls having a break over the the Festive Season! using the wonderful tutorial by Lucy from Attic24! As you can see I have done a little trial run! 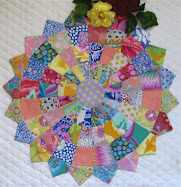 Now to my Blueberry Crush Quilt I made following Bonnie's mystery some time ago! At long last, it is completed and will be donated to a LPG for their raffle at their upcoming exhibition. I would like to think that some of the profits will be donated to Melanoma Awareness and Research - such and insidious disease and so open to us all here with our wonderful sunshine and beaches! 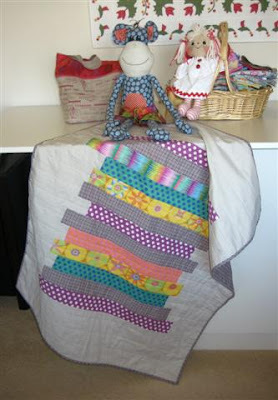 Check on my sidebar for the OPAM 2010 Challenge being run by two lovely girls, Kris of Tag Along Teddies and Peg of happy in quilting ... It is great to have such lovely girls giving us incentive with our stitching, thanks, both of you! Best wishes for success! Those who say, do not know." 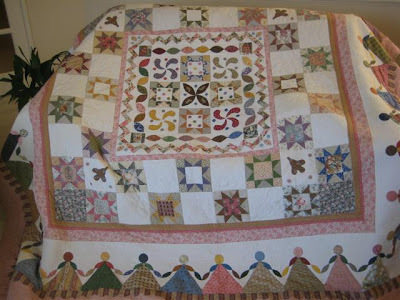 Another well-worn and dearly loved quilt that I have shown a small pic of some time ago. My Angela and her family have slept under this for years - how I ever made it amazes me, though I know I did do it - it is soooo big! 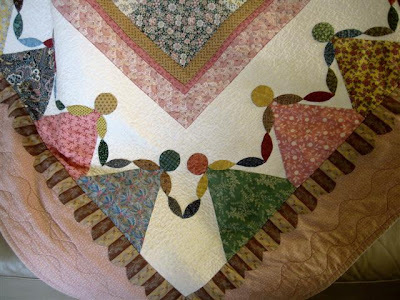 The middle section is an interpretation of the Sarah Johnson Quilt, 1826 - I think she made this quilt when she was only 14-years old! 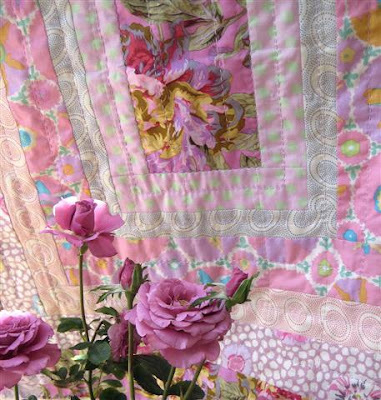 My quilt was started perhaps 11 years ago and repro fabrics were a bit limited in availability then - I was so fortunate to have what would have been a small collection and perhaps swapped fabrics with friends! 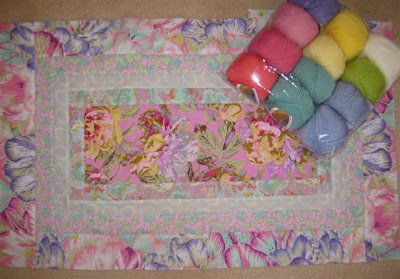 I think the inspiration for the dolly border came from a cushion published in an Australian patchwork magazine, so here is the finished quilt and I think it will itself become an antique one of these days! Would be nice! Now to the present - I have quite a few finishes to do and I'm looking forward to that! Happy Day! Is it true - the way you spend the first day of a new year, predicts the way the year will be for you! Oh, I hope so! 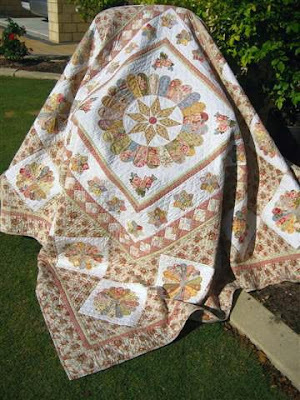 The fireworks woke me at midnight - oh, yes, I thought Twenty-Ten - then snuggled back to sleep under this quilt I had put on our bed. I had a big bedding change and decided this old favourite would keep us warm until I decide to have a another change. 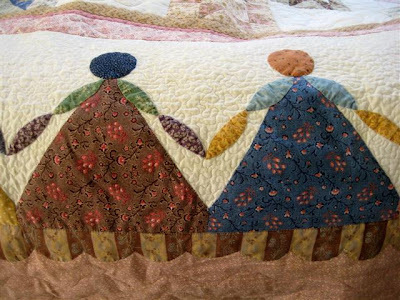 I have shown it briefly quite a while ago, hand-appliqued, broderie-persed, hand-quilted - somehow feels gentle and comforting, meant to be slept under. 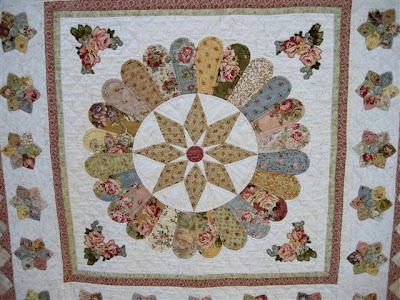 Here's the centre medallion - sometimes I wonder how I put so much fine hand-quilting into this quilt - those days have gone, I'm sure, but it was such a joy then and still makes me happy! Oh, I needed the energy only sleep can bring - it's too long a story to tell - yesterday I took Heidi and Byron to see this wonderful movie - I know they are only 5, but they did look after Nanny as we watched for 2 hours 42 minutes, a long time sporting our 3D glasses. They were able to settle me at the jumpy bits and explain the story to me when I couldn't understand! 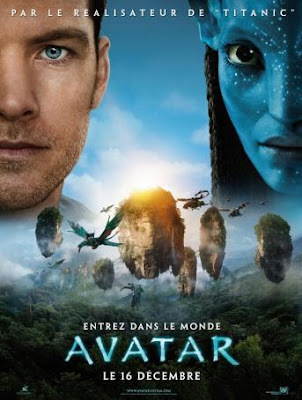 Pure magical technology, a story of fantasy with a lot of pathos and of course our beautiful Sam Worthington, a young man who grew up locally - a great actor and oh, so gorgeous! The littlies are still with us, a few chores to do and then we will think about what the day will bring! 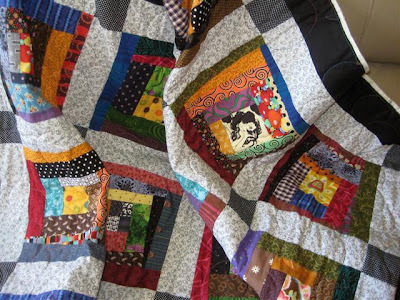 We have a new couple joining us in Blogland, Maggey and Jim of The Quilting Couple - do pop over to say hello if you get a chance - Maggey is taking her tentative steps forward, so let's be there for her!